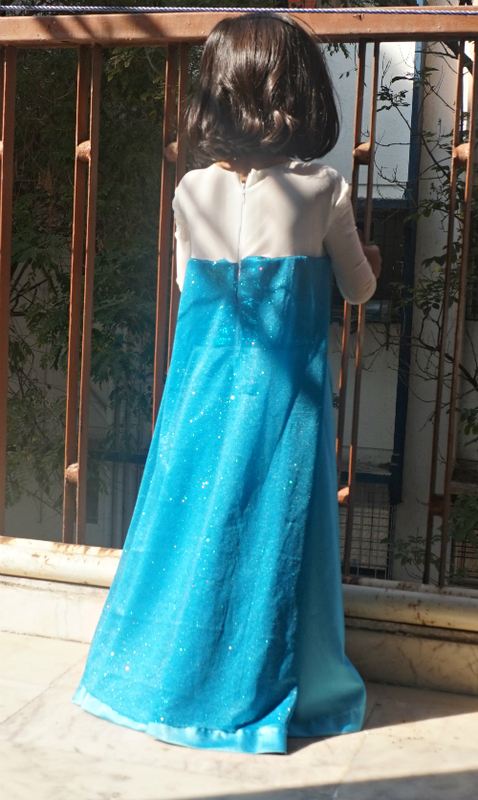 Of all my projects past present and future, I am sure this dress will stand out in my memory as my most loved project. Made to please a darling little girl who I love very very much – my niece Meera. I have made dresses for her before here. 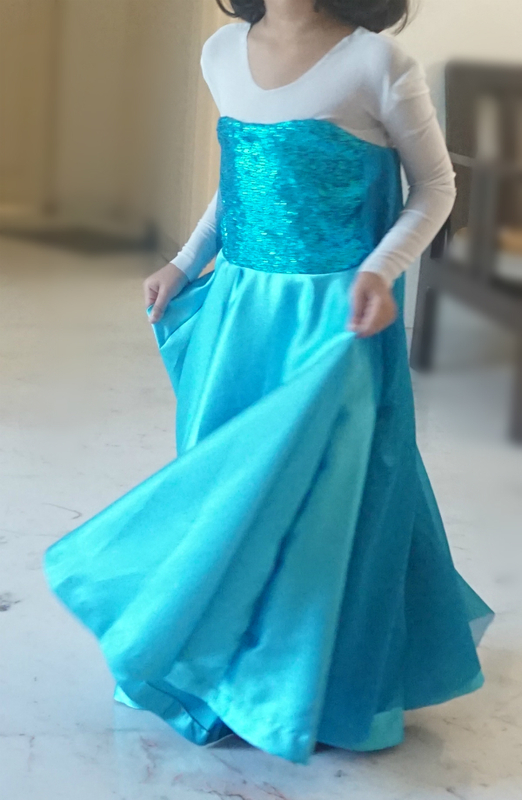 here, and here but this time it was she who asked for the Elsa dress. 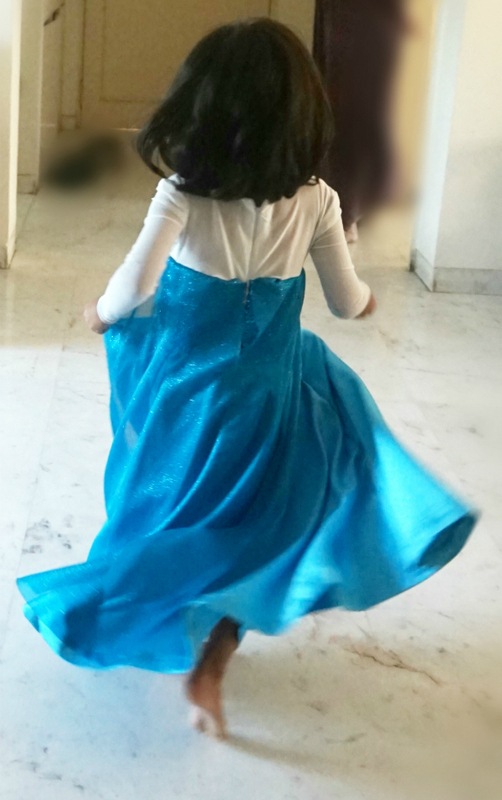 When I told her that I would be making a dress for her, she immediately asked me if I could make her an Elsa dress. Elsa is her most favourite person and she is her number one fan. Of course I said yes. Because I never say no to her. I was very scared as to how I would go about it since I had never made anything like this before. I believe that love makes things happen. I put in so much love and affection and work into this and this beautiful dress did happen!! The dress yoke and sleeves are made of knit jersey, the bodice is sequinned fabric and the skirt is satin. The bodice : I drafted the bodice pattern using this tutorial . I have always loved all tutorials from this channel and this is the first time I have drafted something using them. The tutorials are very well explained and very easy to follow. I drew the yoke line on the bodice freehand. Notice that the back yoke is 1″ below the arm hole. The front bodice was cut on fold and the back bodice had two pieces since the zipper was inserted at the center back. I lined only the bodice. The yoke and the sleeves: The yoke is derived from the jersey block. I lowered the neckline of the jersey and now think it wasn’t really necessary. But since I had made the dress before my niece visited, I realised this only later. 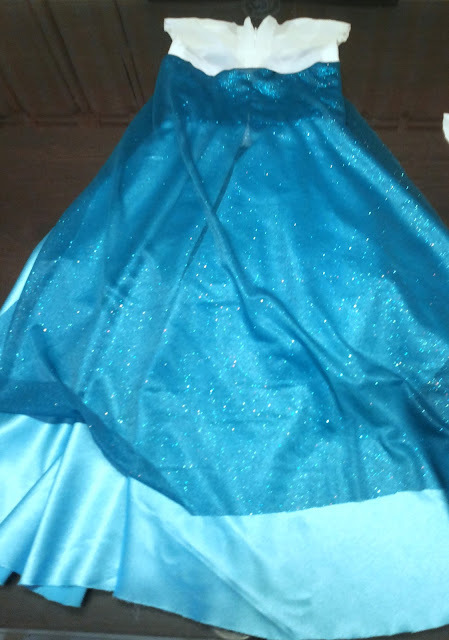 The skirt : is a circle skirt and is really easy to draft. 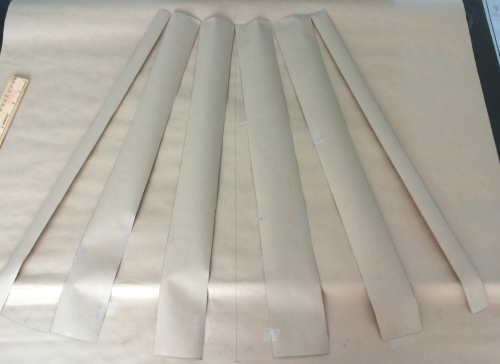 While drafting the circle skirt to be attached to a dress, one should remember to keep the bodice waist measurement as the circumference and not the actual waist measurement. The cape: covers the back and extends onto the front yoke. To draft this I measured the back yoke line where it joins the bodice and added about 2 inches on either side(for the extension onto the front yoke). I drew a rectangle using this measurement and the length of the cape. Dividing the width into 5 parts and using the slash and spread technique the cape pattern was ready. I added a seam allowance of 1 inch on most seams. For the cape, seam allowance was added only at the top since the fabric is such that it does not need any finished. I was unable to find ball point needles to sew the jersey fabric so I just wet ahead and use needle no. 11. Also using tissue paper underneath satin while sewing ensured that the seams were pucker free. I used a walking foot and a small stitch length. The walking foot proved to be a boon. To sew the jersey pieces I used the stretch stitch (looks like a thunderbolt). It was my first time sewing jersey and it was not very difficult. 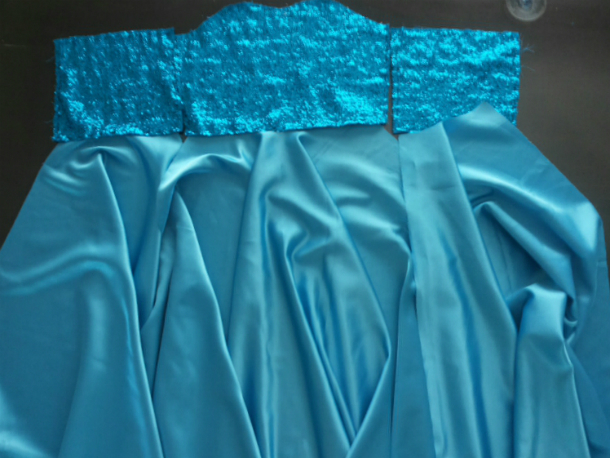 Baste lining to the bodice and treat it like a single layer of fabric. Sew side seams of the bodice. Sew side seams of the skirt. 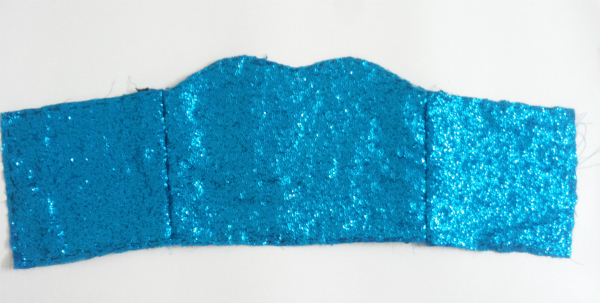 The sequinned fabric was quite soft for a child to wear but I still bound the edges once the seams were sewn. Sew side seams of the yoke. Attach yoke to bodice only a few stitches more than the vertical seam allowance for the zipper. The cape is sandwiched between the yoke and the bodice which is attached once the zipper is sewn. Sew in the invisible zipper. Sandwich the cape at the yoke line (better if you baste the cape to the bodice first) and sew the yoke and bodice together. Since the yoke is a knit it will have to be stretched a bit while stitching to fit the bodice. You will have to cut into the cape for a few inches at centre back to use the zipper. Additional notes: I did not finish the neckline and the sleeve hem. Also, the cape also did not need any finishing. The little one was absolutely delighted. 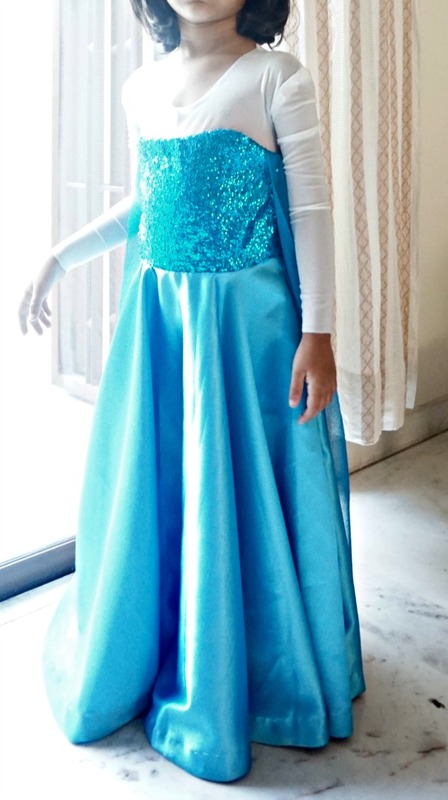 She declared “The dress is beautiful” and then added “It has just enough glitter” 🙂 She danced around and we were treated to a beautiful rendition of ” Let it go”. That day I was the happiest person on Earth! !